Car Sheds - Who Has the Best Car Sheds for Sale in the UK? Car sheds come in all shapes, sizes and designs, making it difficult to know which one you should invest in. With so many high quality models to choose from, it can be confusing knowing which ones best suit your needs. That’s why WhatShed have created this top 15 car sheds list. We spent literally hours browsing the UK market, comparing the different car sheds available and selecting our top 15 winners. There’s something for everyone on this list. Whether you’re looking for a budget-friendly model or a luxury, stand-out building; you’ll find exactly what you’re looking for below. WhatShed has become renowned for its in depth reviews of garden buildings. From storage sheds to car sheds, we know exactly what distinguishes the very best from the average car shed. So how exactly can you trust that the car sheds featured on this list truly are the best of the best? Well, we looked at the top 10 online garden building manufacturers and suppliers. Together they make up a huge 95% of the market. This means as well as ensuring you get the best car sheds available, you’ll also be able to find them easily too. With many high quality car sheds on the market, deciding which one is the best available was a very difficult task. So our congratulations go out to the Lugarde Oklahoma Garage from Taylors Garden Buildings which secured itself the top spot on our league table of the best car sheds in the UK. No matter which type of garden building you’re searching for, WhatShed provides full, in-depth, independent reviews to help you make the best choice for you. When you picture car sheds, it’s highly unlikely you’ll imagine anything as luxurious as the 5mx5.5m Lugarde Oklahoma Garage. When we came across this hidden gem we knew we had to include it at the number one spot. This beautiful building provides you with a stylish, secure area to keep your vehicle, whilst also offering a sheltered outdoor seating area. Its unique log cabin design means it will look outstanding in any garden and it is one of the largest car sheds featured on the list. Though it is the most expensive model on the list, it is also the one that is going to last the longest. So if you’re looking for a long-term, high quality investment, this is definitely the car shed for you. What’s more extraordinary about this model is the fact it is constructed from thick 44mm log walls. It features a large integral canopy and comes complete with attractive, ultra weather resistant shingles in a choice of 5 different colours. Its quality and style is unrivalled. Its door is an up and over model and created form red cedar. There is also a separate access single door. Its size means you can use it as both a garage and a workshop. If you have a large budget to work with then we highly recommend this as the best of the best car sheds on the UK market. 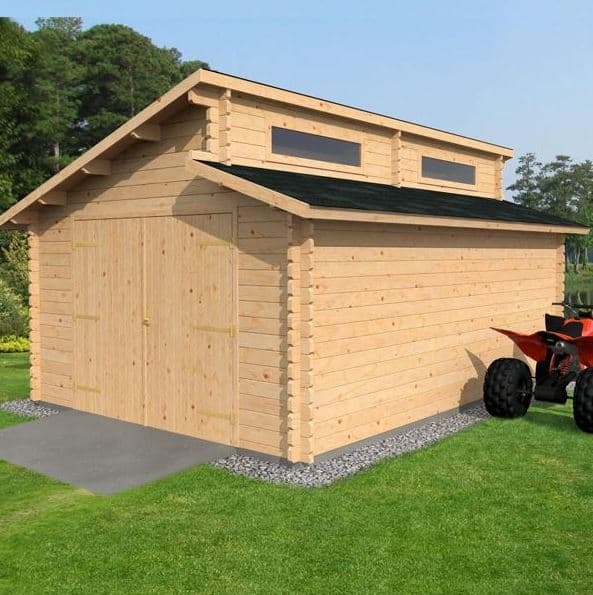 Another log cabin designed car shed, the 4.2mx5.7m Waltons Log Cabin Garage is a cheaper alternative to the Lugarde model above. 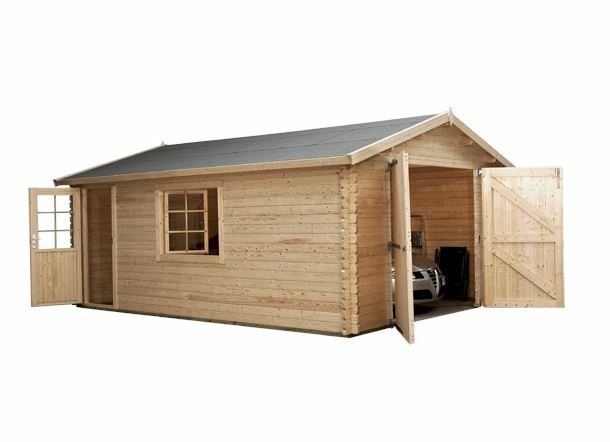 Considering its incredible quality and stylish design, we feel this is one of the best value car sheds on the list. It is also built with 44mm thick log walls, ensuring maximum security and weather resistance. There are many features we love about this model. For example, the large, heavy duty double doors come complete with a key operated lock, ensuring the garage is fully secure. Security does seem to be the main focus of this car shed, making it a fantastic choice for those who live in a vulnerable area. It also comes with a unique opening single glazed window. Unlike most buildings, the window on this model opens inwards for better security. There is also a single door located on the side of garage for quick and easy access. Out of all of the car sheds we researched, this one was unbeaten in terms of quality, security, durability and value for money. 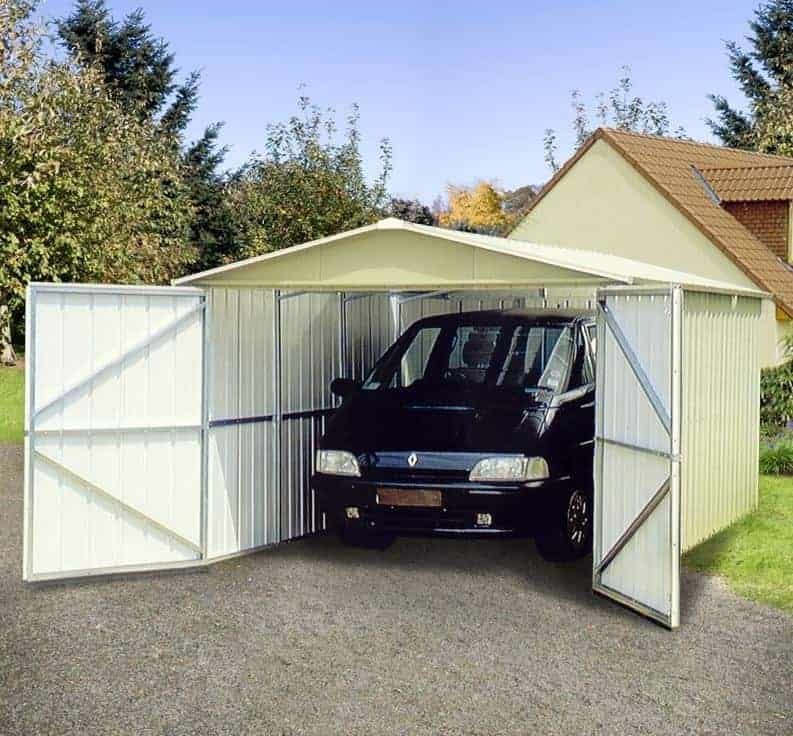 This Titanium Easy Build Apex Metal Garage from Waltons is one of the most affordable, yet longest lasting car sheds you’ll find in the UK. Backed by an outstanding 30-year warranty, we’ve added this model for not just its great value for money, but also for its easy build qualities. Car sheds in general are pretty big. This means they can be fairly difficult to put together. So if you’re looking for car sheds that aren’t going to be too taxing to install, this is the one we recommend. Its Simple Snap assembly means the panels literally just click together and its lightweight design also helps speed up the process. Another thing that’s impressed us and earnt this a well-deserved #3 position on the list is its weather-resistant benefits. 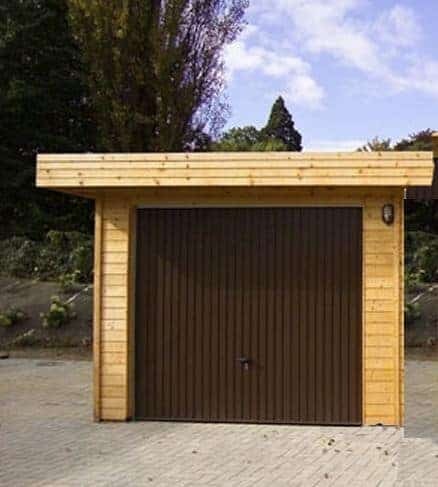 This is the only one of the car sheds to be featured on this league table that is W41-C1 wind proof rated. This means it is capable of withstanding wind speeds of up to 147kmph. So no matter what harsh weather conditions it faces, it’s going to be left standing strong and protected all year round. The manufacturer has also made sure it’s secure. The large doors have been reinforced for extra security and stability. They also come with an extra-wide design and can be locked to ensure your car is kept safe from thieves. This is simply one of the best car sheds available and it comes at a surprisingly low, affordable cost. By now you’ll notice there’s a theme so far on this top 15 car sheds list. 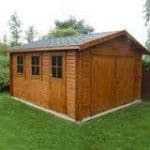 Not only have the car sheds listed all been constructed with a log cabin design, but the majority are also available from Taylors Garden Buildings. This Modern 3mx5m Garage is constructed from 19mm thick log walls and we love its almost Japanese style appearance. A flat roof gives the car shed a ‘Zen’ feel which will fit in with any modern garden design. It boasts a flat roof which makes it a good option for those looking for something a little different. However, what we really love is the several upgrade options available. The standard construction of this model is impressive enough, but you can also choose from numerous great upgrades. For example, the roof can be upgraded to include insulated steel sheets for an additional cost, or you can choose an anti-condensation roof free of charge. We’ve yet to come across any car sheds that offer the same unique customisation options. It features an up-and-over Terrabrown door, providing plenty of space to get your car in and out of the building. Not a fan of maintenance? You can also select to have the garage pressure treated, meaning you would never have to treat it yourself. 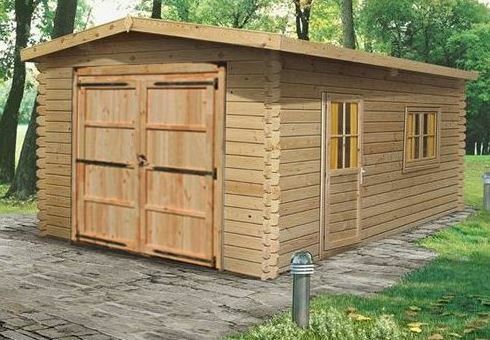 Another luxury model from Taylors Garden Buildings, the 3mx5m Log Cabin Garage has an extraordinary stylish design. It is smaller than the Lugarde model, making it more accessible for those who don’t have a huge level of space at their disposal. It’s still a big building however and will provide an exemplary amount of space to comfortably store your vehicle. So what exactly earnt this a spot on the top 5 car sheds? As well as benefitting from a great attractive look, the car shed has also been built with convenience and security in mind. Large, strong double doors allow very easy access for family size vehicles to pass through. However, it is the single door located on the side of the building that really stands out. A lot of car sheds come with three-door access, but this one comes with a half glazed design. This allows plenty of light into the building without compromising its security. You can also choose whether to have this single door on the left or right hand side of the garage. There is also a separate glazed window to provide more natural light into the building. Another advantage of this model is that it requires zero upgrades. You do have the choice to upgrade from the standard roofing felt to shingles, but this isn’t a necessity. 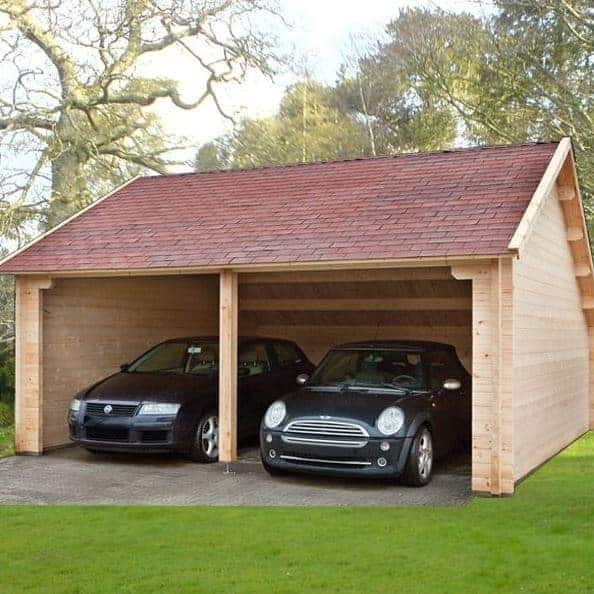 All in all, this kiln dried white pine model is one of the best quality, most stylish car sheds we came across and we’re sure you’ll love it too. 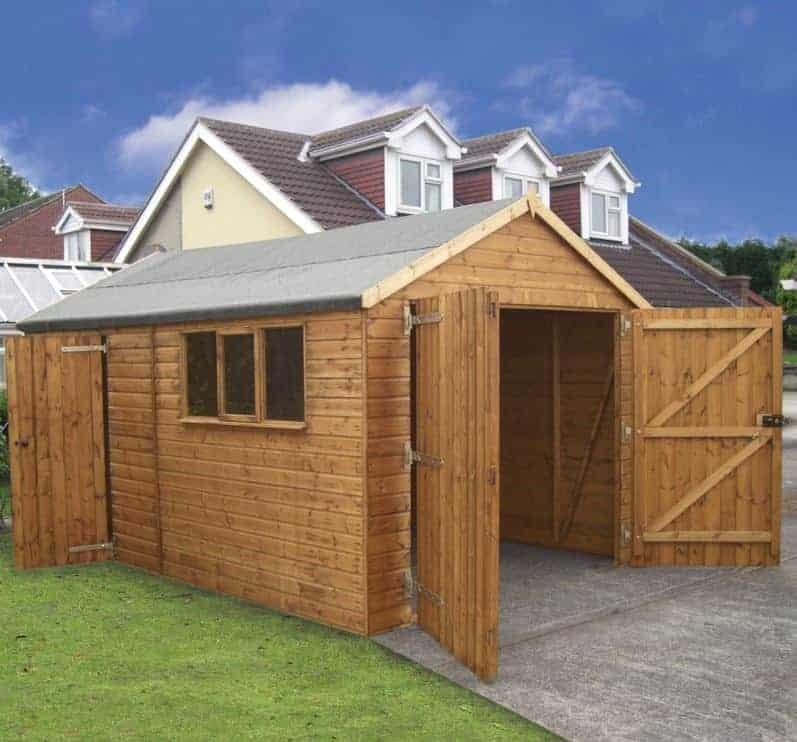 It’s not often a smaller garden building retailer makes it into the top end of our list, but this 13’x12’ timber garage from B&Q is a fantastic model. It is the most affordable log cabin style car shed we’ve found and we’ve been pleasantly surprised by its outstanding quality. The 34mm log constructed walls help to keep your vehicle 100% safe and dry all year round. There’s one thing that particularly stood out to us when reviewing this model and that’s the side door. Like many car sheds, this one comes with 3-door access. However, unlike most of its competitors, the side door has been expertly blended into the side of the building. This is because it features a half-glazed design. The top part of the sturdy door has the same panelled window look as the two opening side windows. So you’re left with a very streamlined design. The front doors on this model are also huge. They provide a staggering amount of access into the building, ensuring you won’t have to worry even if you’re reversing in or out of the garage. Finally, we love that the manufacturer has paid attention to the smaller details. For example, the windows and doors have been fitted with draught seals to not only make it more comfortable in all weathers, but to also ensure it is fully weatherproof. The final log cabin model to be featured on our top 15 car sheds list is this super-impressive 3.8mx5.4m Waltons Garage Log Cabin. Waltons have a wide choice of car sheds available and this one is by far the most visually striking. It has a very unusual split roof design that has enabled the manufacturer to not just offer an exquisitely modern style building, but a more private one too. Between the two roofs, there is an expertly placed window, allowing light to enter the garage without posing a risk to its privacy. Unless a potential thief comes along with a set of ladders, they aren’t going to be able to see inside. This is great for those looking for a more private, secure car shed. In fact, this is one of the most secure car sheds available on the UK market. The solid doors are fitted with an integrated key operated lock, the walls are constructed from 44mm log cladding and the window is double glazed. Usually the windows included on any garden building come with single glazing as standard so this is just one stand-out benefit of this model. Overall it’s a fantastic model that is going to last for many, many years. Moving away from the log cabin design, this 14’x12’ Traditional Deluxe Wooden Garage is an excellent quality, Redwood clad building. 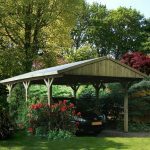 At WhatShed we’re huge fans of the Treetops Traditional range so naturally when we came across this luxury model we had to include it in the top 15 car sheds list. The one thing that sets Treetops Traditional buildings apart from the competition is their sheer durability. A tree could fall on top of this car shed and it wouldn’t cause it to cave in! So if you’re looking for a model that will withstand anything the UK weather has to throw at it, this is by far the best one to choose. 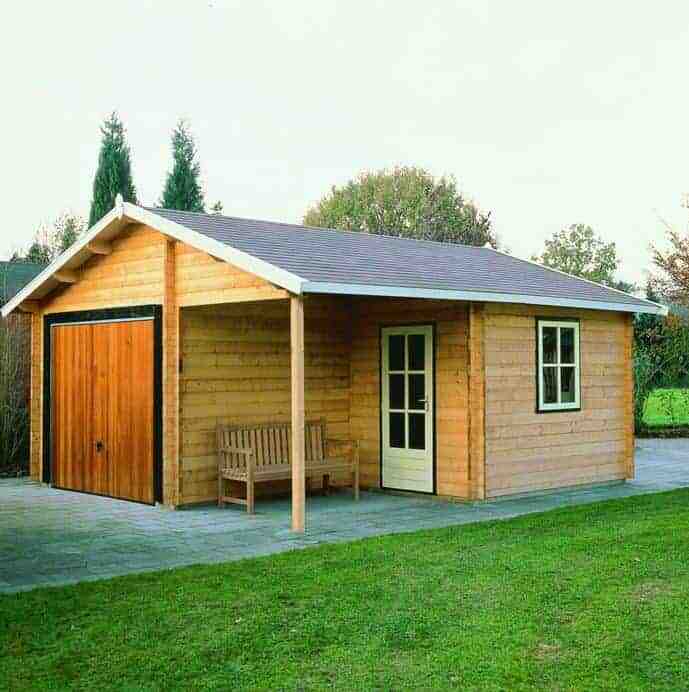 It comes with the same high security benefits as the garden sheds constructed by the manufacturer, including a built in key operated lock. We also like that you can customise the windows on this model. As standard three windows are included. Two of them are fixed and one is openable. You can upgrade it so that two, or all of the windows are openable, or you can remove them completely from its design. The ability to customise its privacy is fantastic and something you don’t get with most car sheds. Overall this is one of the few car sheds on the list that will suit absolutely anybody. Taylors Garden Buildings have once again made it onto the list. Out of all of the car sheds we’ve come across, this one has the most amount of customisation options available. You can choose to add a tantalised frame for the base, upgrade to toughened glass windows, upgrade the already very secure lock and choose from a fantastic range of different coloured finishes. Even without the customisations, this is a truly exceptional car shed. The manufacturer has focused primarily on strength and stability, offering a well-framed building that is guaranteed to last. The 3 lever security lock is especially impressive, guaranteeing to keep your vehicle safe from thieves. Its size is another obvious advantage. So far the car sheds we’ve listed have been pretty large. This one is therefore more attainable for the average homeowner. We can’t recommend this car shed high enough. If you’re still not convinced, how about the fact it also comes with free installation? Not many car sheds offer this included in the price. 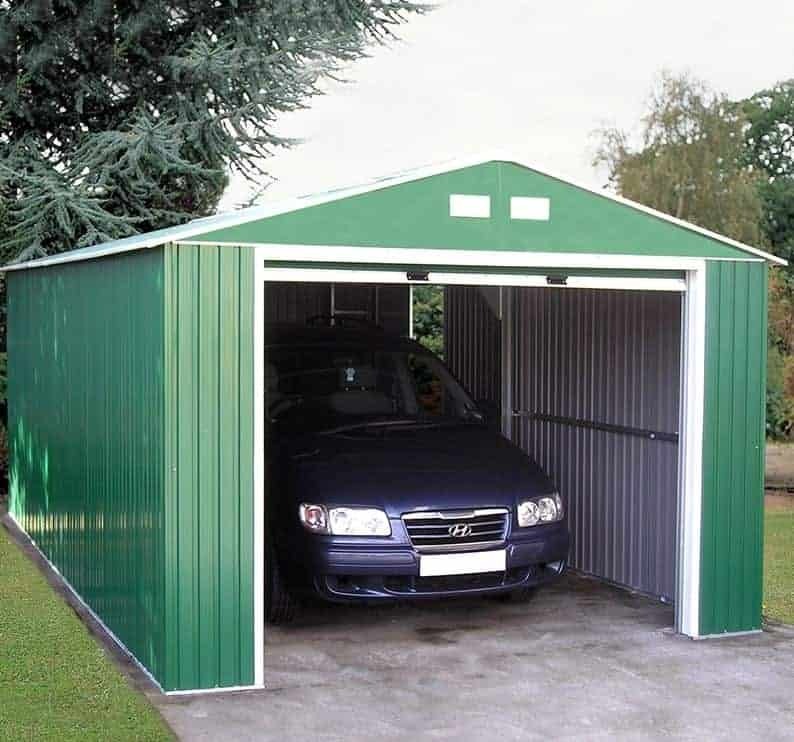 The 12’x20’ Emerald Olympian Metal Garage is one of the most popular metal car sheds in the UK. 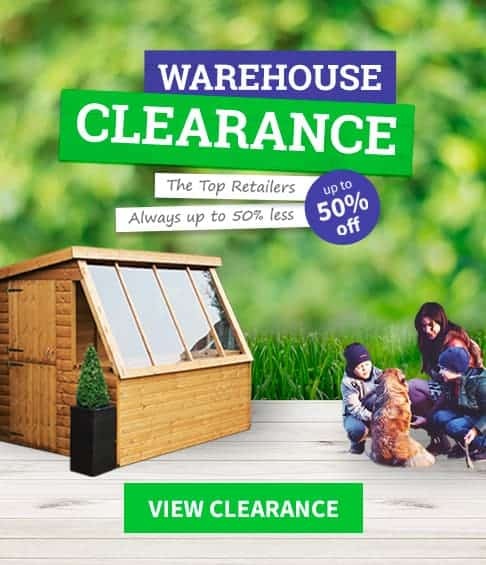 Available from most major online garden building retailers, it offers a high quality, crack and fade resistant design and is constructed with hot dipped galvanised steel. This means, no matter what elements it is exposed to, you can be sure it will look as good as new for years to come. We’ve included this model for those who want a no fuss, no maintenance car shed. Want to get your car in and out of the garage without worrying about the doors closing on you? The roll up and over large front door eliminates this worry. This is a unique feature at this price level and is yet another thing that makes this car shed stand out. As it’s a metal building, one thing that can be a potential concern is condensation. However, the manufacturer has thought of this and included vented gables to ensure a constant airflow gets into the shed. We’re quite surprised by the affordability of this model too. Its low price and great list of features is what makes this one of the most popular car sheds available online. So far we’ve focused largely on one-vehicle car sheds. 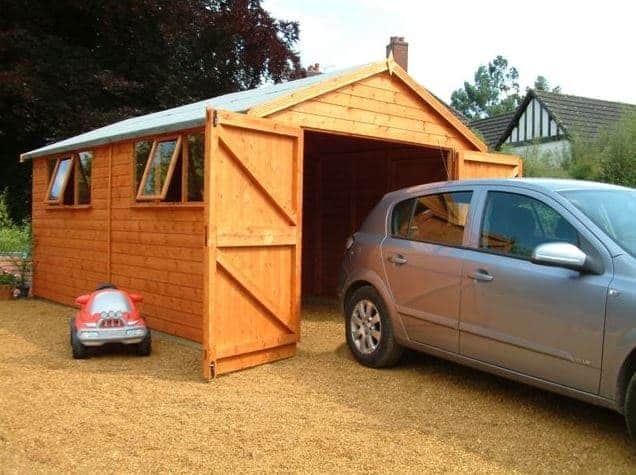 This outstanding 6mx6m Waltons Field Barn Wooden Garage is great for those who need to safely store two vehicles. It has an open-front design which we love because it means you can easily manoeuvre your vehicle in and out in the minimum amount of time. Despite its open design, it also offers a very solid look. As well as thick, durable walls, the building comes with wind-tight chalet connections. These not only add to the stability and weather resistance of the building, but also to its overall visual appeal. So if you are concerned that it’s open design may expose your vehicle to the elements, you can rest assured they will be safe and dry in this car shed. It does come at a higher cost than most of the car sheds featured on this list. However, when you take into account its huge size, the capability to store two vehicles, its exceptional quality and durability, you’re actually getting great value for money. So if you’re looking for two-vehicle car sheds, this Waltons model is the one to go for. Metal has never looked this stylish! 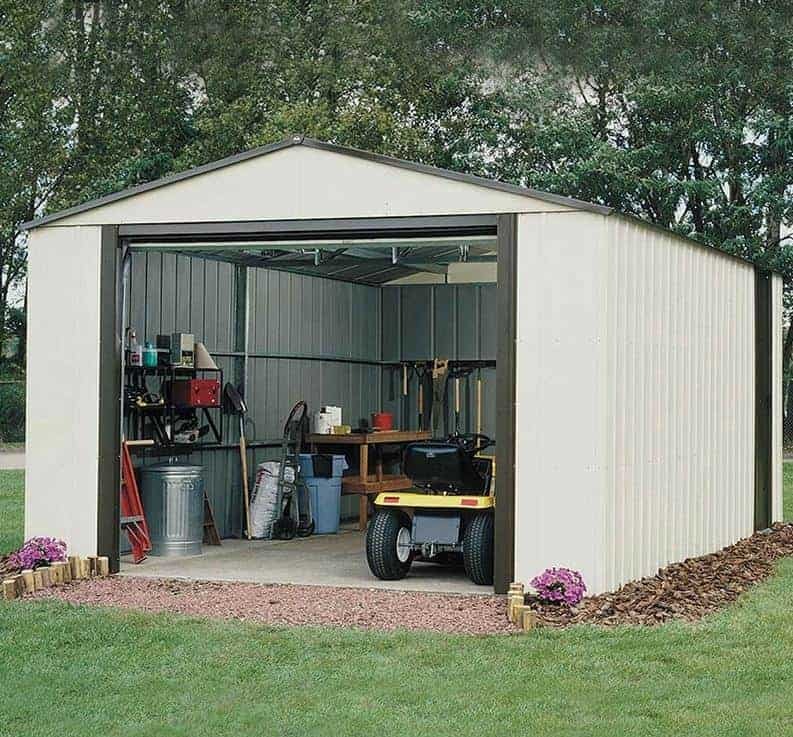 The super 10’x16’ Duramax Steel Framed Vinyl Clad Apex Metal Garage Shed is a large, private, zero maintenance model. With its light, cream design, this metal car shed is set to look great in any garden. The fact that it comes pre-painted is a major benefit, but it’s also covered by a few extra features too. For example, it isn’t just rust and rot resistant; it is also fire retardant too. Considering its affordable cost and zero maintenance benefits, the resulting 15-year warranty that comes from its rust, rot and fire resistant features makes it a fantastic investment. Like all good car sheds, this model benefits from 3-door access. A single door is situated at the side of the garage, whilst the front benefits from extra-large double doors for simple, quick access. There is one window at the side of the building, but it’s pretty small so doesn’t pose much of a privacy risk. Not quite the size you were looking for? 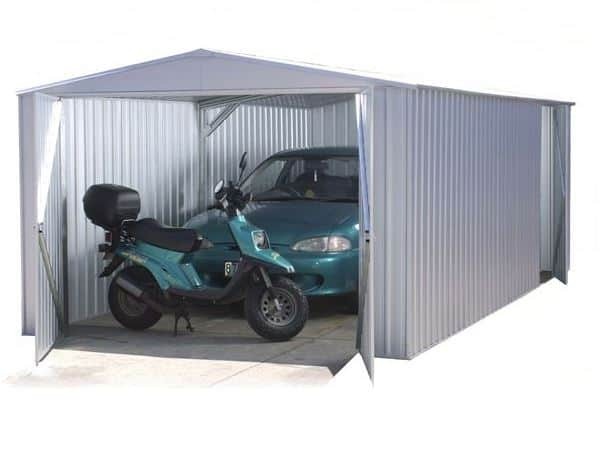 This is one of the few metal car sheds featured on the list that comes in a wide range of different sizes. If budget, low maintenance and privacy are high on your list this is one of the best car sheds you can buy. Created with top quality galvanised steel and coated with zinc, this 10’x19’ Canberra Metal Garage is one of our most affordable picks in our top 15 car sheds list. Guaranteed to keep your vehicle safe as well as secure, this metal garage comes with an outstanding 20-year warranty. For the price you’re paying we think this is an extraordinary benefit. We also really like its two-tone mist green and cream design. This ensures you’re not just getting a long-lasting building, but a stylish one too. So what features can you expect from such an affordable car shed? Well, the manufacturer claims it will not fade or crack over time, its heavily braced doors open out extra-wide for excellent access and it is also rodent proof. 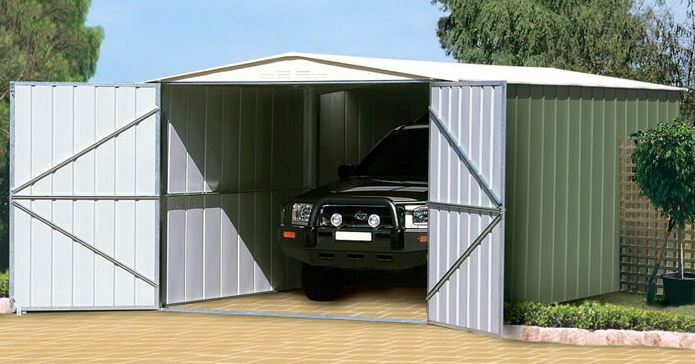 You won’t find more robust car sheds at such a budget-friendly cost. The Canberra range is known for its excellent quality design. Capable of storing any size family vehicle, this is our recommendation for those seeking quality as well as affordability. Rowlinson is a leading name in the car sheds market and this Murryhill model is one of its best selections. What makes it stand out from so many of its competitors is its size. This is the largest of the car sheds to be featured on the list. This makes it a brilliant choice for those wanting a building they can use as both a car shed and workshop or general storage area. The fact it is so easy to obtain, being sold by a number of the leading UK garden building retailers, is also a big advantage. It comes with a great 15-year warranty and substantial framing. Despite being lightweight enough to ensure easy assembly, this is one tough building. We also like that it can be locked; a feature that not many car sheds seem to offer. So if security is a worry for you, this is a good model to invest in. There is a side door which can be conveniently placed on either side for easy access and the front door is unique in the fact it has an ‘up and over’ feature. Considering its huge size, this really is one of the most affordable car sheds out there. Just be sure to have a spare day available to put it together! 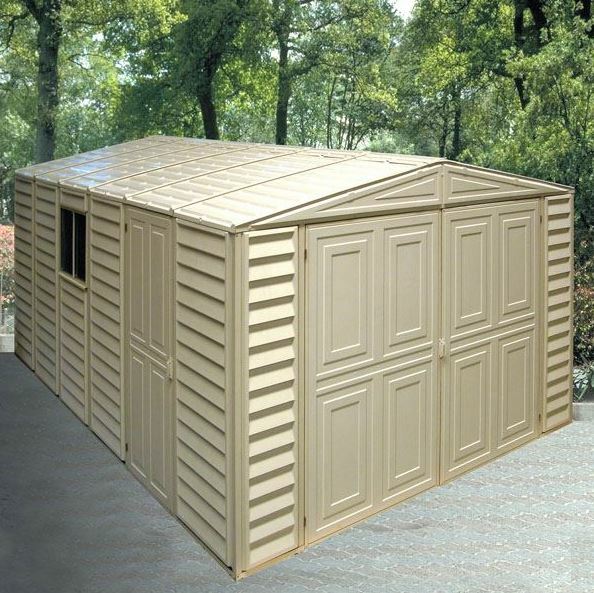 Last to make it onto the list is the 10’x17’ Yardmaster Apex Metal Shed. The lowest priced model to be featured, it comes with a stylish, painted design. Two of its roof panels are completely translucent to enable light to filter in without affecting its privacy. We also really like it’s strength. You might expect one of the lower cost car sheds to be a little flimsier than the rest. However, the manufacturer has made sure that every part of the building is strong and stable, including the double hinged doors. If you’re worried about security, you’ll also like the addition of the holes in the handles which allow you to fit a padlock. To increase its great value for money, a free anchor kit is included. This makes sure the car shed is firmly fixed to the ground. With a 10-year warranty and no maintenance requirements, it’s not hard to see why this low cost model is one of the most popular car sheds out there.